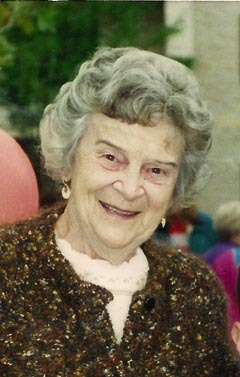 Lucille Mauk Baxter of Willow Valley Manor North, Lancaster, PA, passed away on August 26, 2011. Born on April 19, 1914 to Dr. George E. and Ethel Swift Mauk in Woodland, PA, Lucille grew up and attended high school in Clearfield, PA. She continued her education and graduated from the University of Pennsylvania School of Occupational Therapy. While doing her class rotation at Norristown State Hospital, she met and married her dearest love, Robert G. Baxter, Jr., her husband of 44 years, and worked at the State Hospital as an occupational therapist until her retirement in 1977. Lucille and Robert made a home in Norristown, where they lived with their only daughter, Barbara Lee, until his death in 1978. Lucille moved to Lancaster, PA in 1993. Lucille was a member of the Valley Forge Chapter of the Eastern Star, and for many years a member of Trinity Lutheran Church in Norristown, PA. She was an excellent bridge player and avid reader. Sewing, needlework, and knitting projects for all her grandchildren was her great joy. Lucille was preceded in death by her parents, husband Robert, and sisters Joanne Hitchcock and Pauline Batchler. She is survived by her only child, Barbara Lee Schultz and husband Karl; grandsons, Chris D. Reno and wife Toni, Eric B. Reno and wife Luann, and Seth C. Reno and wife Michelle. She is also survived by 5 great grandchildren, Logan, Preston, Bianca, Colin and Casey. A private memorial service will be held at a later date with immediate family. In lieu of flowers, contributions may be made in honor of Lucille to the Cystic Fibrosis Foundation-Cure for Casey, Delaware Valley Chapter, 2004 Sproul Rd., Suite 208, Broomall, PA 19008; or Ascension Lutheran Church, 600 Penn Gant Rd., Lancaster, PA, 17602; or Hospice of Lancaster County, 685 Good Drive, P.O. Box 4125, Lancaster, PA 17604-4125.